LANSING, Mich. - Max Pentecost starred in his first game in 16 months and Jon Harris combined with Angel Perdomo on a two-hit shutout, leading the Lansing Lugnuts (17-14) to a 5-0 victory over the South Bend Cubs (19-13) on Thursday night at Cooley Law School Stadium. Thanks to the trio of top Blue Jays prospects, the Lugnuts ended a season-high four-game losing streak. The 11th overall pick in the 2014 draft, Pentecost had not played in a Minor League contest since August 7th, 2014. He wasted no time in making his presence felt, cracking a first-pitch RBI single in the first inning off South Bend starter Kyle Twomey (Loss, 0-3) to open the scoring. The ball was misplayed by right fielder Eddy Julio Martinez, allowing a second run to score. 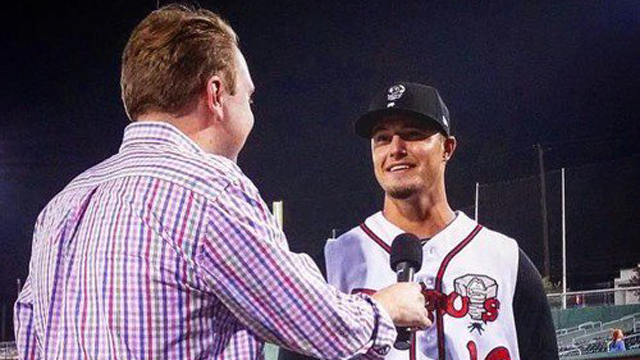 The former Kennesaw State Owl increased the Lugnuts' lead to 3-0 in the third inning, crushing his first professional home run to right-center. Four batters later, Josh Almonte hooked a two-run double down the left field line. Pentecost grounded to shortstop in the fourth before finishing a 3-for-4 evening by lining a single to left field in the seventh. By then, the Lugnuts' talented pitching duo had things well in hand. Harris (Win, 2-0) - the Blue Jays' 2015 first-round selection - allowed two singles and two walks, striking out two, in five scoreless innings. He was succeeded by Perdomo (Save, 1), who dazzled with seven strikeouts in four scoreless innings, allowing only a two-out walk in the sixth. It was the Lugnuts' sixth shutout of the year, second best in the Midwest League. Lansing and South Bend play the second game of their four-game series on Friday the 13th at 7:05 p.m. Don't get triskaidekaphobic on us! Left-hander Ryan Borucki makes his Lugnuts debut against South Bend right-hander Adbert Alzolay (3-0, 2.30). To purchase tickets, stop by the Cooley Law School Stadium box office, call (517) 485-4500 or visit lansinglugnuts.com.